The Eliminator is the world's #1 axle. It features a proprietary heat treating process that provides excellent wear and strength characteristics. Its is then polished and chrome plated, giving you a product that is superior in strength as well as good looks. Many of the models come with the patented Posi-Lock system which removes threaded sections from the flexing area of the shaft (a source of crack generation). Use this axle for all forms of racing and high performance applications. It comes with a lifetime warranty against bending or breaking warranty ( see warranty card for details). Call or E-mail C&D Racing for price and availability!!! The X-33 axle uses the same superior material and heat treating as the Eliminator. The unique difference is in the design of the wheel hub mounting area. Standard design ATV axles neck down to about 1" in diameter. A splined wheel hub slides onto the axle shaft and is retained with a hex nut. As all ATVer's know, hubs loosen frequently. The X-33 changes all that. The wheel hub is clamped solid and driven by a pin on a 1-3/8" diameter shaft. This axle is rifled to reduce weight near the rotational axis of the ATV. This axle allows 16 different wheel offset alternatives. The warranty is the same as the Eliminator. Call or E-mail Platte Valley ATV /C&D Racing sales representative for price and availability!!! Heavy Duty axle (not shown): This axle is a recreational level axle. It is zinc finished and has a six month warranty against bending and/or breaking. 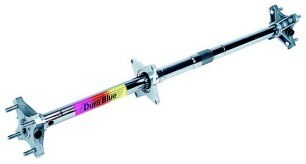 This axle is twice the strength of the stock axle and is recommended for non-jumping type riding. This fully bushed, chrome plated sway bar kit fits all a-arm ATV's and is used to keep the ATV flat during cornering. All Durablue housings are equipped with double lip seals and over size bearings for more capacity and more surface area contact on the axle. Each housing is ready to use. Front; The front lowering kit is a device that relocates the upper shock position, higher, thereby lowering the machine. Rear; The rear strut is adjustable much the same way as a tie rod. You can expect about 1" to 1.5" of lowering. Durablue has perfected a fiber-reinforced wheel hub with an exclusive "cast around" steel insert for superior spline wear and strength/ No other aluminum wheel hub on the market can hold up to Durablue hubs because all other wheel hubs have aluminum splines which wear out very easily. EZ Fit; The finest wheel spacers available. These spacers are an exclusive compound of urethane and titanium. The mounting hardware attach to the existing press-in studs, providing a well supported foundation for the spacer. Available in 1.5" and 2.5" for most models, these spacers will provide both wheel clearance and a more stable ride. Graph-lite; This series spacer is the same material as the EZ Fit. The difference lies in the mounting procedure. These spacers require the removal of the press-in studs. Long hex bolts insert through the holes, spacers and wheels. In order to tighten, the head of the bolt must be accessed. These spacers will not work where the head of the bolt is hidden, such as some four wheel drive models. You must use the EZ Fit for these machines. Durablue front wheel hubs are machined from solid heat-treated aluminum in a "classic" design. They are light, yet the strongest available. They use standard bearings and seals from your stock hubs, a great cost saver. As an extra bonus, you can order your Durablue hubs with screw-on hub caps. The caps have the distinctive "bullet" design to match the "Bullet Nut Series" wheel and axle nuts and provides such superior sealing that no outer hub seal is necessary. Durablue now has the famous Posi*Lock style axle retaining nuts available for non-Durablue as well as Durablue Axles. These nuts have fewer parts than the OEM nut assemblies and are less sensitive to vibration and harmonics (the physical motions responsible for loosening). They are an excellent addition to any well maintained machine. wheels,axles and the new Durablue billet front wheel hubs. Durablue's Sprocket hubs are some of the finest Aluminum products available today. Most of the hubs are C.N.C. Aluminum and are available for most Durablue or stock axles. For availability for your make and model contact C&D Racing.